Rusty Frantz, President & CEO, NextGen Healthcare The healthcare delivery and payment system in the U.S has been shifting from a volume-based model to a value-based model over the past few years—thanks to the reforms including Affordable Care Act that granted more power to the hands of patients. The movement received a big boost with the U.S. Department of Health and Human Services (HHS) announcing its plans to broadly implement value-based care in the next two years. With significant government funding at stake, numerous healthcare organizations are classifying themselves as Accountable Care Organizations (ACOs), and others are developing ACO-like healthcare delivery systems, to align themselves to the new paradigm. 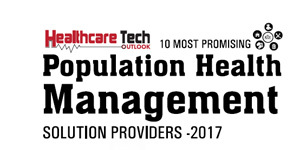 Population Health Management (PHM) is acting as a catalyst for this change, with the sole focus to improve care delivery and lower costs, while providing the right care at the right time. "As healthcare evolves and value-based care changes the way we provide care and get paid, NextGen is by customers’ side as a technology-enabled solutions partner"
For almost 25 years, NextGen Healthcare has helped healthcare organizations improve outcomes and nurture healthier communities with innovative technology and services. A wholly owned subsidiary of Quality Systems [NASDAQ: QSII], NextGen Healthcare offers NextGen Care, a population health and care management solution designed to streamline the care team’s workflow, while helping them manage patient populations, drive better outcomes and decrease cost of care delivery mandated by evolving value-based payment models. The solution helps enhance the overall health status of a given population by providing care or support at the earliest practical point in the care continuum. This is in contrast to treating disease at the acute care level. There is a specific focus on minimizing expensive interventions like emergency department visits, hospitalizations and tests by managing health problems at the least expensive point of care. It also provides risk scoring, to deliver actionable insights and point-of-care alerts, enabling care team members to easily identify gaps in patient care, automate outreach and manage specialist referrals—especially for those with chronic conditions. “As healthcare evolves and value-based care changes the way we provide care and get paid, NextGen is by customers’ side as a technology-enabled solutions partner,” says Rusty Frantz, President and CEO of NextGen. Rusty oversees planning, operations, and functions of more than 25 integrated health information technology (HIT) and connectivity solutions for Quality Systems, Inc. (QSI). The company helps more than 85,000 providers in ambulatory, inpatient, dental, and community healthcare share and aggregate data, collaborate, and make smarter decisions to drive better population health for increased value-based reimbursement. NextGen Care, a complete, collaborative care solution, is built on the company’s core ambulatory solution suite and it fully integrates with the NextGen ambulatory product suite as well as patient engagement and measurement tools including NextGen Patient Portal and NextGen Dashboard. NextGen Care combines automated patient outreach with an embedded care management suite affording care managers the ability to execute multiple tasks for multiple patients―all from a single screen. With PHM at the heart of collaborative care, NextGen Care enables any practice to identify high-risk patients, as well as those requiring preventive care, and deliver proactive targeted outreach anytime, anywhere. In addition to managing care from a single platform, the interoperability achieved through NextGen Share, a national health information service provider (HISP), further facilitates seamless data sharing to ensure that care team members—internal and external—have access to patients’ longitudinal health records. Providers and clinicians can use NextGen Care to improve clinical and financial outcomes and meet the ever-increasing demand for quality reporting while significantly reducing the cost of delivering, monitoring and measuring care. NextGen Care complements Mirth Care Enterprise, the recently launched vendor-neutral platform unveiled by QSI’s subsidiary Mirth. The company has developed a cohesive delivery system that facilitates easy access, sharing and analysis of health data all the while bringing care team members the right information, the way they want it, when they need it. NextGen Care equips the clients with the population health management solutions necessary to drive strategies and interventions, allowing them to improve the health of the individuals within the patient populations they manage in the most cost effective manner. According to Tammy Rondel, RN, BSN, Chief Nursing Officer, Mountain Lakes Medical Center, NextGen’s solutions made their patient information more complete and updated. The Mountain Lakes Medical Center is now more accountable, and it easily ensures that they are being paid the maximum amount the law permits for each patient encounter. As reporting requirements for new payment models evolve, there is a need for cutting-edge intelligence to make decisions and share information among the network to address the demands of value-based care and improve reimbursements. Driving enhanced patient outcomes and improving population health and disease management—NextGen is using powerful data to better group, monitor, document, and manage patients and their follow up. The customers are able to leverage data and analytics for enhancing preventative care, overall care coordination, campaign management, and patient relationships alongside connecting with any predictive analytics program to enrich their data repository. The users are able to gain robust performance tracking to monitor, report, and improve outcomes and also engage patients in a meaningful care transition program. NextGen’s Patient Portal involves patients while meeting value-based care goals. “Patient engagement is about building relationships with the patients and providing them with the medical information and tools they want, when and where they want it,” adds Frantz. “With our Patient Portal, patients become advocates for their own healthcare. And entailed patients are healthier, happier patients.” NextGen’s patient portal empowers patients to self-serve and connect with online tools and resources to satisfy their health, wellness, and communication needs. According to Kate Dwyer, Database Analyst, Eye Associates of New Mexico, with approximately 90,000 patients enrolled in the NextGen Patient Portal, the doctors and staff no longer use valuable time fielding phone calls and interpreting phone messages. Patients can think through their questions and type them through the Portal, and likewise the doctors are able to respond thoughtfully and type their responses. With the onslaught of changes in healthcare, regulatory mandates, and the demand for high-quality reporting, care teams need interoperable solutions like NextGen Care to succeed. The company prides itself on putting care first and helping healthcare organizations achieve interoperability across silos. “We deliver value-based care. Our clients participate in over 33 percent of ACOs. Over 40 percent of NextGen Healthcare primary care clients are accredited Patient Centered Medical Homes (PCMHs),” adds Frantz. For supporting sole practitioners to sophisticated multi-specialty and large group practices with complex billing needs, NextGen Healthcare has more than 25 specialties, configurable specialty-specific templates, and dedicated experts, delivering client success with measurably better clinical outcomes and business results. The company’s interoperability solutions share data between disparate systems and locations to facilitate the collaborative care of more than 150 million patients. “We have made a tremendous amount of progress up to this point and we are now starting to transition into Phase 2 of our strategic plan—build for innovation. Our focus for this next phase is to implement a strategy that allows us to capitalize on the opportunities within our large established client base,” concludes Frantz.